As most readers understand, the multi-family property sector has been on a tear for the last seven years with primary growth indicators reflected in the last five years across much of the United States and, certainly, in Raleigh-Durham’s Research Triangle region. Overall, the Triangle market has been fueled with an influx of new residents (and capital) seeking affordable and/or short-term housing solutions until they determine their long-term plans; many of the newcomers are millennials and baby boomers who are considering downsizing their homes. Between 2010 and 2015, the Raleigh-Durham area’s population grew by 16.5%, making it the fastest-growing metropolitan area in the nation, according to MPF Research. As millennials quickly become the majority of the new entrants into the job market and family formation continues to be delayed, there is a continued increase in the relative demand for rental properties of all types, with apartments continuing to lead the way. Developers have responded with a historic level of construction, delivering an average of 4,600 units per year between mid-year 2012 and mid-year 2017 with another 5,550 units slated to be completed over the next four quarters. In spite of this record level of deliveries, occupancy levels have held consistently between 94% to 95% since 2012, while lease rates have been climbing at an average of 3.5% per year since then, according to MPF Research. Well-capitalized developers have had no problem securing favorable short-to-long-term financing solutions from a wide variety of lenders, including Fannie Mae, Freddie Mac, the Federal Housing Administration/Department of Housing and Urban Development, commercial mortgage-backed securities (CMBS), the U.S. Department of Agriculture and insurance-related loan product types. Lending terms have been extraordinarily favorable with common loan-to-value ratios of 65% to 75% and interest rates ranging from 3.26% to 4.85% based on loan type. For bridge loans, interest rates have ranged from 8.99% to 13.00%, with limited fixed periods available, and construction loans have hovered around 5.25%. Lenders’ overall appetite for writing new loans has diminished somewhat and will impact some developers’ ability to finance new projects, but we believe that there is no short-term end in sight to the continued growth of the sector in the Triangle. According to a recent National Multifamily Housing Council (NMHC) and National Apartment Association (NAA) study, North Carolina will need an additional 220,000 apartments by 2030. If one were to assume that the Triangle region will supply approximately a third of the statewide inventory, our region would need to add a total of 73,333 units, or 5,641 units per year, by 2030. If, however, the Triangle’s demand equates to 40% of the statewide production, developers would need to deliver an average of 6,769 units per year. Finally, investors continue to be enthralled with our region’s multi-family assets with approximately $1.4 billion worth of inventory trading in 2016, according to MPF Research. Volume and prices have cooled from the peak of 2016 with volumes down 41.9% on average and prices down 6.5% ($125,000 per unit) year-over-year. As of mid-year 2017, the national average sales price was $151,000 per unit versus $125,000 per unit in the Triangle, with prices varying based on product type. In recognition of the strong demand for multi-family properties, Avison Young is expanding its multi-family service offerings in Raleigh as part of a companywide initiative to expand Avison Young’s footprint in the sector. The famous quote from the 1995 movie, Apollo 13, is a phrase that is often used to indicate an unforeseen problem. However, this iconic Hollywood tagline from Tom Hanks, who played Mission Commander Jim Lovell, is not only a misquote, it’s attributed to the wrong astronaut. It was Jack Swigert (played by Kevin Bacon), who radioed NASA Mission Control Center and said, “Ok, Houston, we’ve had a problem here,” after they discovered an explosion had crippled their spacecraft. Although Hollywood may have changed the tense of the phrase for dramatic effect, it didn’t change the substance of the event, but Swigert may have felt slighted for not getting the credit for his famous quote. This brings to mind the recent unforeseen flooding problems brought on by Hurricane Harvey to the Greater Houston area. The famous tagline once again echoed throughout the city, and, the country. However, Houston’s resiliency demonstrated that we can take a hit, regroup and continue to grow and prosper even after being struck by the worst storm to hit Texas in more than a generation. It’s not surprising that Houston can “take a licking and keep on ticking”. It has built a strong foundation with economic engines centered around energy and medicine, exemplary post-secondary education with world-class universities, an outstanding transportation system and an affordable cost of living. Amazingly, commercial real estate was unaffected by Harvey’s flood waters. And, based on the market activity, investors are still very bullish on Houston. Unfortunately, Harvey did the most damage to homes, flooding approximately 100,000 homes and causing tremendous personal loss. Also, there were an estimated 300,000 cars lost to the flood waters. Going forward, the City of Houston, Harris County, as well as the state and federal governments will undoubtedly invest in a new water drainage infrastructure for the residential areas that were hardest hit. I am confident the system will be able to withstand future storms of Harvey’s magnitude. Downtown Houston and the Medical Center flooded badly during Allison, but withstood Harvey because of the infrastructure improvements that were made after Allison. We learned from Tropical Storm Allison and we will do the same with Harvey. Owners of multi-family projects benefitted most from Hurricane Harvey, as occupancy has soared due to displaced homeowners leasing apartments. Many investors are concerned that there is a huge roll-over risk as short-term leases expire. However, by offering short-term leases to homeowners, and staggering lease expirations, many owners have ensured they are not burdened with a big inventory of units to lease at one time. Prior to Harvey, there was a balance of supply and demand, so it looks like natural absorption will buffer short-term lease expirations, thus, paving the way for another good development cycle for multi-family. Click here for third quarter reports on the Houston market. 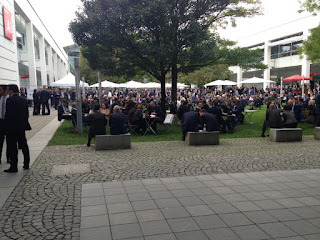 I attended Expo Real again this year in Munich (October 4-6). It is a regular stop on my travel calendar, and in my opinion one of the better venues for transacting business. For those who have not been there, picture a cluster of major aircraft hangars on the periphery of town, all populated with exhibitor booths of varying shapes and sizes. Exhibitors range from cities (i.e. municipal governments) to investment and asset managers to brokerages to banks to professional associations to a variety of service providers, all competing for the attention of a hoard of attendees -- reportedly more than 41,500 this year. A sea of dark suits clambering over each other in an effort to be on time for half-hour meetings that have been set up in the various booths within the complex. Sometimes if the weather is good, as it was this year, meetings can be rescheduled outside, where seats have been set up in a courtyard setting. In typical German fashion, the discussions are extremely efficient. A half hour does not allow for much small talk. After initial pleasantries, it's time to get down to business. Introductions dispensed with, it is time to see if there are opportunities that might fit, services that can be provided, or further meetings that need to be set up. It is fascinating what can come out of such meetings when everyone knows there is only a limited time frame for discussions. After a full day meeting with dozens of contacts, and bumping into several others on the way to such meetings, it is time to chill at the Munich or Düsseldorf stand and savour some excellent German beer while reviewing some of the takeaways from each meeting. It is a terrific setting to build networks that may grow into meaningful relationships. And the overall summation of this year's Expo? Very positive feedback from European investors with respect to the future of European real estate, especially in Germany. Not quite so bullish on North America. Lots of discussion on whether there will be housing corrections in Toronto and Vancouver. Are interest rates heading up? Will there be any capital growth in commercial real estate in Canada next year? Hedging costs are a significant dent in investor returns, especially in the U.S.
Having said all of this, major investors will continue to seek out investment opportunities in North America as part of their overall global allocation to real estate. But they are likely going to be more wary, especially given the global geopolitical environment that we currently face. Major investors will require up-to-the minute advice when it comes to seeking out suitable opportunities, and the best advice is provided face to face. Expo allows this interaction to happen in the most efficient manner, and as such will continue to be on my calendar. I am already planning for next year! The Greater Toronto Area (GTA) office leasing market remained robust throughout the third quarter of 2017 as demand once again outstripped supply, resulting in a continuation of the downward trend in the region’s overall availability and vacancy rates. Heading into the year’s final quarter, a wide gulf in market dynamics (both tenant options and pricing) persists between the landlord-favouring Downtown and Midtown markets and the tenant-favouring suburban markets. Noteworthy during the quarter was Amazon’s search for a North American location for its second headquarters, which captured the attention of the Toronto market. A unified proposal is being prepared, with Amazon’s final decision not expected until sometime in 2018. All five office districts contributed to the GTA’s positive third-quarter performance as occupied space increased by 827,000 square feet (sf) – with demand evenly distributed between downtown/midtown and the suburbs. As has been the case for much of the year, class A buildings captured the lion’s share of the growth. The GTA’s overall availability rate inched closer to single-digit territory, falling 60 basis points (bps) quarter-over-quarter to 10.4%, and is down 80 bps year-over-year. Already in single digits, GTA vacancy declined 40 bps to a nine-year low of 6.8% and continues to nudge down toward historic lows not seen since the beginning of this century. Toronto West accounted for all the GTA’s new supply during the third quarter, comprising three buildings totalling 107,000 sf – bringing the year-to-date GTA-wide tally to 11 buildings and 1.9 million square feet (msf), of which 78% is leased. More than three quarters of the new supply (by office area) has been delivered in the downtown market. To keep pace with demand, construction is confirmed or underway on a further 26 office buildings amounting to 6.7 msf (49% preleased). The under-construction tally is now at its highest level since third-quarter 2008, when 7.1 msf was underway. Toronto’s red-hot downtown market reached another milestone with overall availability (6.4%) and vacancy (2.7%) falling to historic lows – backed by a solid performance, this time, by class A buildings in the Financial Core and Downtown South. Large-block requirements for immediate occupancy are virtually non-existent, with little (or no) relief in sight for at least 24 to 36 months – keeping upward pressure on rents. Downtown’s robust growth is anchored not only by the traditional FIRE sector, but a growing interest from creative companies in the technology, advertising and media industries, which are attracting a steady diet of venture capital. On the development front, though not on the scale of Ivanhoé Cambridge and Hines’ CIBC Square (2.9-msf) construction and lease announcement (with CIBC for up to 1.75 msf) last quarter, Allied Properties REIT and Westbank have preleased 100% of the office space (146,000 sf) in their mixed-use development at 19 Duncan St. to Thomson Reuters for its Toronto Technology Centre, scheduled for completion in 2021. In other news, global management consulting firm Boston Consulting Group chose CIBC Square (phase 1 / 81 Bay St.) for its future Canadian headquarters (85,000 sf), while Cadillac Fairview renewed international business law firm Torys LLP (183,000 sf) at its TD Centre complex. Meanwhile, First Gulf began marketing The Shift – a 24-storey, 460,000-sf office tower at 25 Ontario St. – near its recently completed Globe & Mail Centre. Demand for shared office and co-working space has spread to Toronto’s Midtown Bloor office node. Having opened its first location in Downtown West and with a deal imminent in the Financial Core, WeWork finalized a 36,300-sf lease at 33 Bloor St. E. Not available until mid-2018, Midtown’s largest block (180,000 sf) remains at 121 Bloor St. E. Nevertheless, Midtown is still tight, with overall availability and vacancy of 6.2% and 3.7%, respectively. The suburban market contributed to the GTA’s positive third-quarter performance, with decent occupancy gains in each of Toronto North, East and West – sufficient to lower overall suburban availability and vacancy to 14.5% and 10.9%, respectively. While losing tenants to downtown is an ongoing concern for some landlords, the suburbs continue to secure their share of the GTA’s leasing activity. In Toronto North’s North Yonge node, CIBC renewed 141,000 sf at 5650 Yonge St., while Minto Group inked a 40,000-sf deal to relocate from 90 Sheppard Ave. E. to 4101 Yonge St. In Toronto East, Sony Canada finalized a deal for 40,300 sf at 2235 Sheppard Ave. E. in the Consumers Road node, vacating 145,000 sf at 111 Gordon Baker Rd. in the Highway 404 & Steeles node. In Toronto West’s Airport East node, Aecon Group explored the market but renewed at 20 Carlson Ct. (97,000 sf). These transactions and others are a testament to major users’ appetite for well-located and affordable suburban office product in the GTA. Investment in the Canadian commercial real estate sector is buoyed by a relatively healthy economy that is the envy of the G7 countries and a commercial property market that continues to see varying, but largely healthy, fundamentals across the country’s regions and asset classes. With record amounts of capital still seeking a home, investors continue to find ways to buy into Canada’s finite investable commercial real estate sector. Capital from domestic and foreign investors continues to be largely directed towards Vancouver and Toronto, while the other major markets are also seeing their share of activity. On the vendor side, capital recycling continues in order to reduce debt, upgrade asset quality and diversify investments geographically. Surplus capital that can’t be placed domestically often finds its way south of the border, as Canada has retaken its place as the primary source of foreign investment in U.S. commercial real estate. Canadian institutional buyers, such as Ivanhoé Cambridge, Oxford Properties and the Canada Pension Plan Investment Board – on their own or in joint-ventures – were active during the first half of 2017 across major U.S. markets, including Chicago, Los Angeles, New York, San Francisco and Washington, DC, with office properties being the most notable assets purchased. Domestically, among the top-ranked transactions by dollar volume in Canada’s six major markets, office assets were the most numerous, followed by retail and multi-family. Office transactions ranked among the top five in all markets except Edmonton, comprising a combination of partial-interest, single-asset and portfolio sales. Following a record $28.4 billion in commercial real estate investment sales in 2016, Canada’s six major markets had first-half 2017 sales of almost $19 billion – up $4.3 billion, or 29%, compared with the first half of 2016. Investors coveted office and retail assets, which combined for more than $10 billion in trades, or 55% of the first-half investment tally. Vancouver ($7.8 billion/41% share) outpaced Toronto ($6.5 billion/34% share) with investment proceeds surging 75% year-over-year as vendors sought to capitalize on strong demand and peak pricing. With the exception of Ottawa (which saw investment activity plunge 57%), the remaining markets – Calgary, Edmonton and Montreal – all recorded increases year-over-year, and each exceeded the $1-billion mark. Supported by notable $200-million-plus transactions, office was once again the top investment sector with $5.3 billion in sales – an increase of 16% year-over-year – and captured 28% of total dollar volume. Toronto and Vancouver made up almost three-quarters of the national office total as investors poured nearly $2 billion into each market, mirroring the results registered one year earlier. Disrupted by e-commerce, the retail sector was a close second with $5.1 billion in transactions (27% share) as first-half investment more than doubled year-over-year. This result was bolstered by tremendous interest in Vancouver, which saw its country-leading retail investment total nearly quadruple year-over-year to $3.1 billion. Toronto was a distant second, with $1.3 billion in volume. First-half investment in industrial product came in at $3.3 billion (17% share) nationwide – up 35% year-over-year. All markets recorded growth in transaction volume with the greatest sales total in Toronto ($1.7 billion/53% of the national total). Accelerating industrial market drivers continue to be tenants’ demands for modern, high-ceiling logistics and fulfilment centres, and for facilities close to major urban centres for last-mile delivery service. The multi-family sector was not far behind with $3.2 billion in first-half transactions (17% share). Perhaps the most restrained markets by scarcity of available product, Ottawa and Toronto registered declines compared with first-half 2016; meanwhile, sales in Vancouver increased 146% to more than $1.5 billion, leading the country. Finally, the least-traded asset class was ICI Land as $2.1 billion worth of properties changed hands during the first half of 2017. Year-over-year, this was the only sector to record a decline in sales (-11%) as dollar volume decreased in all markets with the exception of Montreal. Average capitalization (cap) rates were marginally lower across all markets and all five asset types (with the exception of suburban class A office, which was flat) compared with one year earlier. Multi-family assets commanded the lowest yields – closely followed by retail – while overall rates showed the greatest compression year-over-year in Vancouver and Toronto. Almost three months into the second half of the year, we have already seen more than $3.5 billion change hands in Canada, including the likes of the 1.1-million-square-foot (msf) Constitution Square office complex in Ottawa for $480 million and Dream Office REIT’s estimated $1.4-billion office portfolio sale in Toronto, as well as a half-interest in Scotia Plaza.